Quaint and Quirky: $50 Inkwell Press Gift Card Giveaway! $50 Inkwell Press Gift Card Giveaway! If you read my last blog post, you'll know that I'm a fan of the new Inkwell Press planners. 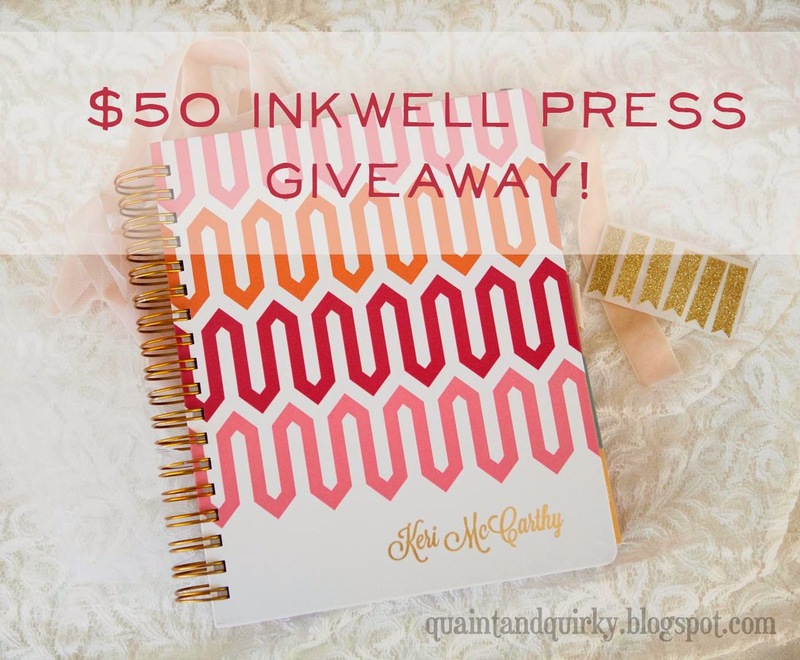 I'm so much a fan that I am giving away a $50 Gift Card to Inkwell Press! That means you can get a free planner if you win! Don't need a life planner? They are coming out with fitness, food planners and notebooks soon! (I *believe* you cannot use a gift card on shipping, so anything you order, you'll have to pay shipping). I am leaving the giveaway open until 11PM EST on Friday, December 5th, 2014. I will announce a winner and email the gift card code on Monday, December 8th. 1. Leave a comment. Any comment is fine, but if you want, you can tell me what portion of your life needs more organization. will get you $10 off your first $50 order! Once again, this post is not sponsored by Inkwell Press. I have purchased this gift certificate on my own. I just love the planner THAT MUCH! My fitness and health needs to be organized to get me back to where I was. I need organization in general! My mommy life is so hectic! I follow you on Instagram and shared on Facebook! I need organization in my home and finances. I followed you on instagram! I need to organize everything - things to do, places to go, crafts I *want* to do, etc. I shared the giveaway on Facebook before I even read your post :D And I already follow you on instagram, and will share there, too! I need help organizing my day into manageable portions. I get distracted easily and lose focus. I am now followin you on all platforms. I need help staying on top of my fitness goals. I'm following you on Instagram and I tweeted. I am a wife and mommy and I need to be organized period. I've shared your post on Facebook and in following you on Instagram. I need to organize my entire life! :P I'm getting WLS and it would be a good way to keep track of my goals. This planner looks like it has everything! Would love to see if it could help keep me and the fam organized! I haven't seen the meal planner but I know that I am going to love it! I also pinned this post and shared on Facebook AND Twitter! 4 entries! Woot! Such an awesome giveaway! I tweeted, followed you on Instagram and shared on both Instagram and Facebook :) I would love to get something from Inkwell Press!!! I need more organization because I work as a school librarian, a children's photographer and have a toddler. Thanks for the offer!! My time management needs more organization! My meal planning and fitness need some major planning/organizational help. My grocery shopping/meal planning needs serious help! All areas of my life need organising ! I'd like Annabelle to start organizing her sleep habits. Will the planner help with that? I pinned the giveaway but forgot to add the hashtag. I'll get right on it! I need to organize my uni life! Sometimes I miss homework because I didn't know when the due date was. I followed you on Instagram as @Peachhcake. I need to organize my Tastefully Simple business better and control my to do list. I pinned, tweeted and shared your giveaway on facebook and I follow you on Instagram now. Love this! I can't imagine there is any area of my life that couldn't use some better organizing! I pinned this and I follow you on Instagram ( @sarasocial). I need to organize my cleaning routine. From I have guests coming I need to clean to I can't stand this mess I need to clean is not working well for me. Pinned, followed on Instagram, and shared on FB. Ohh I have been dying for one of these! Not only are the designs so cute, but I am in desperate need of something offline to keep me organized. My job has a lot of events and I love having them out in front of me to know how much to work each week. (I also pinned *rachelshine1214* and followed on Insta *rachelshine1*).